Greetings all from frozen NE Illinois! I inherited my dad's Sea Lancer a few years ago when he passed away and I'd like to make it seaworthy again and get it back as 'original' as I can. I have no clue as to where to start, so maybe you all can point me in the right direction if I give you a few details. My dad bought the boat new back in 1962 in Waukegan, IL. It's yellow with a copper bottom with mahogany deck, dash and gunwales. 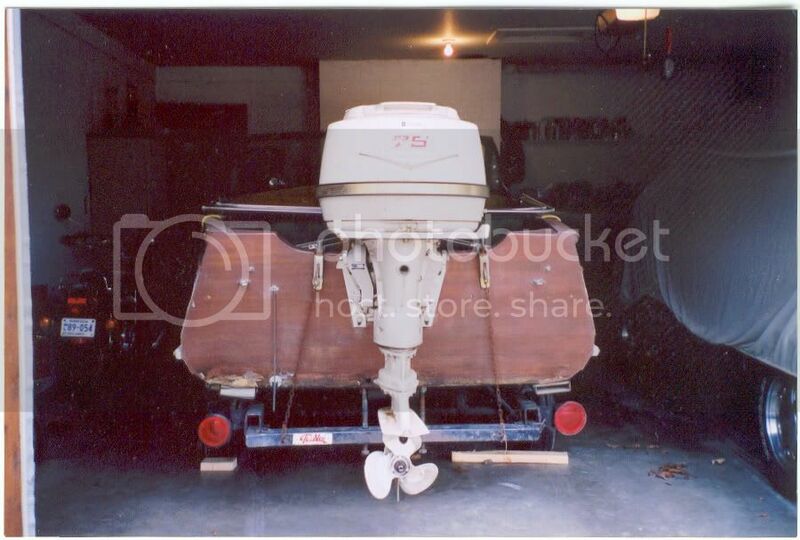 It was garage kept most of the years; I can remember one summer back in the early '90's when he kept it docked at a marina and after he took it to Florida, it spent a few weeks on the lift station behind his house. 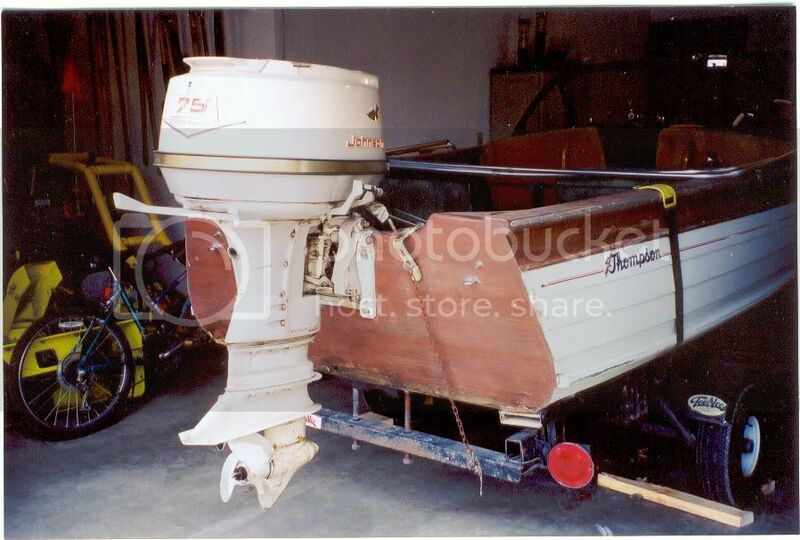 While it was in FL, he decided that it needed some upgrading and he had a number of things done to it: he had the original 75 horse Johnson, the regulator, the cable steering and some of the gauges removed in lieu of a 80 horse 4 stroke Yamaha, hydraulic steering and some new gauges. 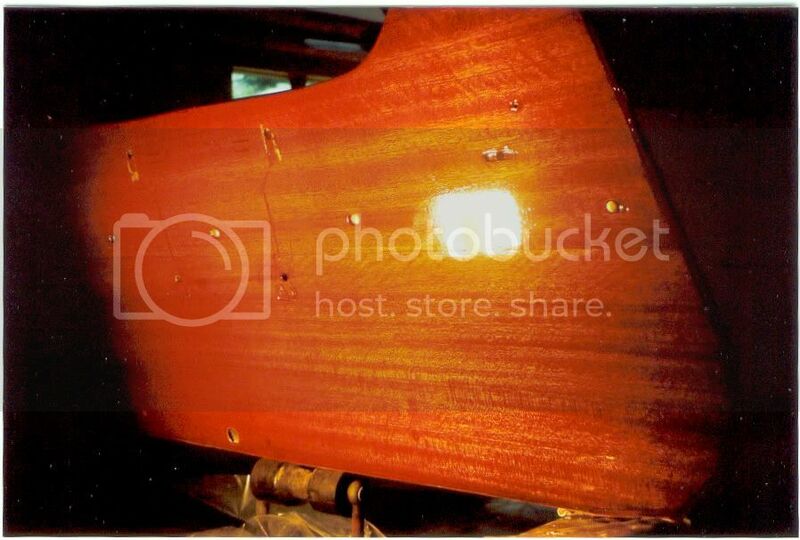 He also had the bottom of the boat gelcoated and the entire transom was fiberglassed and painted from what had been a beautiful mahogany, to yellow. I cringed the first time I saw it because it didn't look the same, but after doing some light reading here, it sounds like I may have more reason than that to cringe. The wood strips on the sides (splash guards?) were removed and lost. The Yamaha engine, turns out, is far too heavy for this boat and it sits in the water with it's bow pointed toward the sky. How do I begin to enjoy this boat? 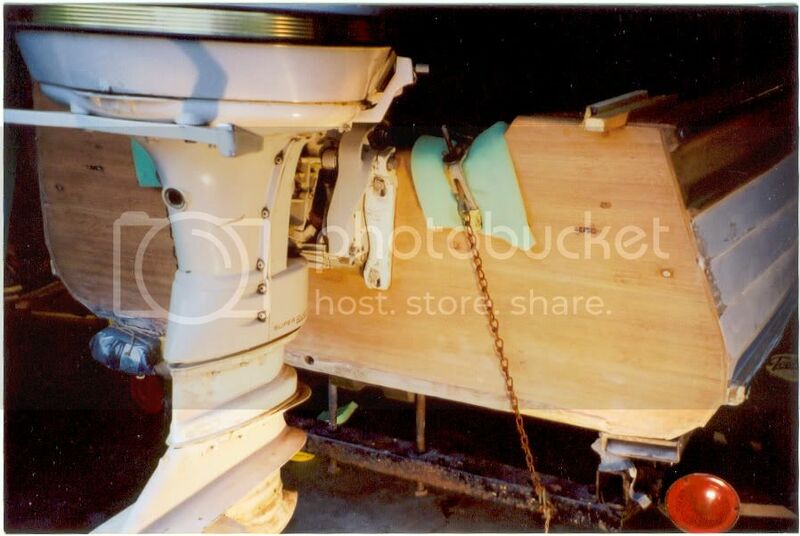 I thought that I could find a 60 horse Yamaha engine and just put it in the water and go, but after reading about how bad it is to fiberglass a wood boat, I don't know what to do. I'd like to get some kind of idea on what it would cost to get it back to 'original' as there is no way I could take on a project like this. (I've found that I'm a good 'taker aparter' but not so good at the 'putting back together') Who restores wood boats? Is it restorable after being gelcoated? Did I inherit (and promise to never sell) a gigantic paper weight? Welcome aboard. Nice looking boat. Never heard of a wooden boat being gel coated. But if it had resin or some other googe put on the wood, it may be the root of a long standing problem. But then again, maybe not. First and foremost you must make certain the boat is seaworthy and safe if you are going to use it. You as the skipper are responsible for the safety of passengers. 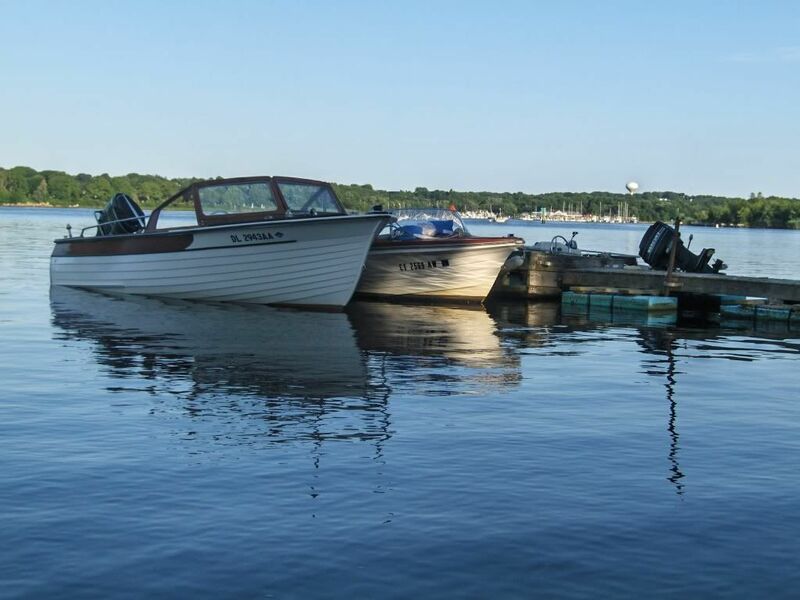 If you are unable to inspect the boat and make sure it's safe, find a reputable surveyor that is familiar with wooden lapstrake boats and pay for a survey. Do not get a person that is not experienced with wooden boats. I imagine that there are some wooden boat surveyors in Chicagoland. Maybe Fox River Boatworks? Larry Lange at Lake Geneva, WI. Jim Staib in McHenry? There is no way to know how much it will cost to remove the fiberglass or whatever was put on the hull and get this and other aspects back to original. If done by a boat restorer it will probably cost more than the boat is worth on the open market. 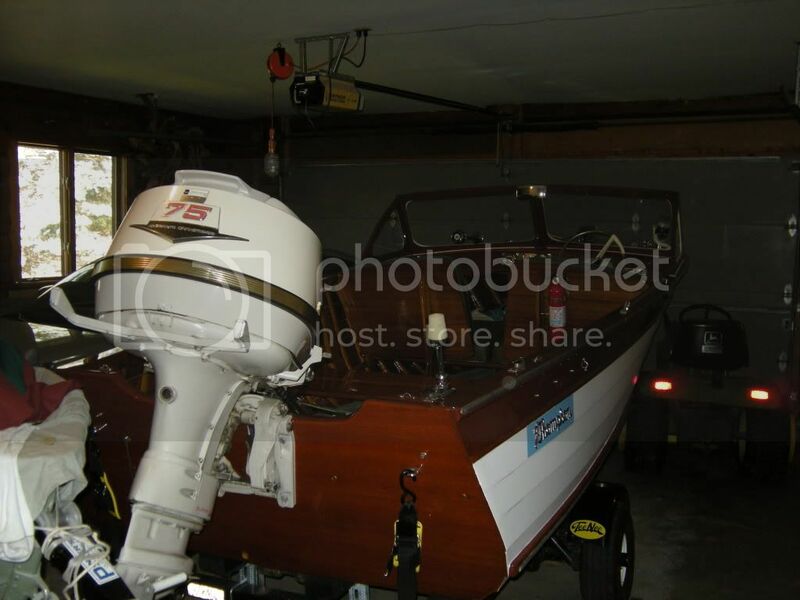 No one will be able to give you any accurate advice or pricing until they look at the boat and make an inspection. Start attending events of the Blackhawk Chapter of the Antique & Classic Boat Society (www.acbs.org) and begin to network with other classic boat enthusiasts. All the folks mentioned above are members. Other folks in Chicagoland may have additional suggestsions for surveyors. They might have a display at the Chicago Boat Show this month (it might be this weekend). If the boat is in Florida, try the Sunnyland Chapter of the ACBS. They have a huge show on Lake Dora in March. The Antique Outboard Motor Club (www.aomci.org) is another great place to start networking. They have chapters all over North America. If she is indeed a 1962 Peshtigo Sea Lancer, she should have two padded "eyebrows" on the dashboard. 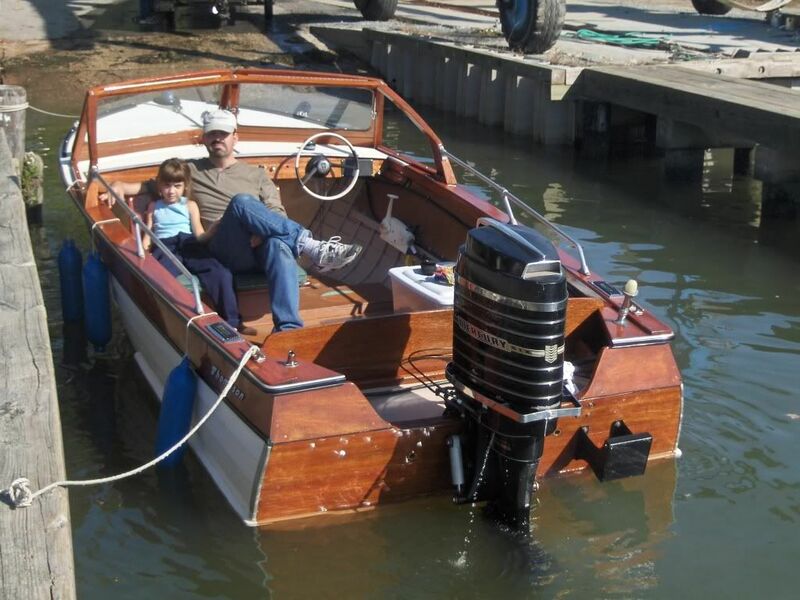 The boat is rated for up to 100 HP. Hi Andreas. Thanks for the reply. The more I think about it, I have to say that I am not 100% sure that it was gelcoat that was put on, but that's what I was told. I don't even know who did it... my dad was always a fan of 'whoever can do it cheapest'. Thank you for mentioning a surveyor... I didn't even know such a profession existed, but it makes sense. It'll be the first thing I do. I did find Fox River Boatworks during my google search, but it looks like they do a lot of CC stuff. Would they still look at my boat? I'll shoot them an email and ask! The boat is indeed here with me in Illinois and I didn't even think about the boat show downtown. I will have to check that out as well. And if the dash pad eyebrows are a giveaway, then mine is a Peshtigo unit. While the pads are currently MIA, I absolutely remember them being on when I was little, then being stored in our attic when I was a teenager to now not knowing where they are! 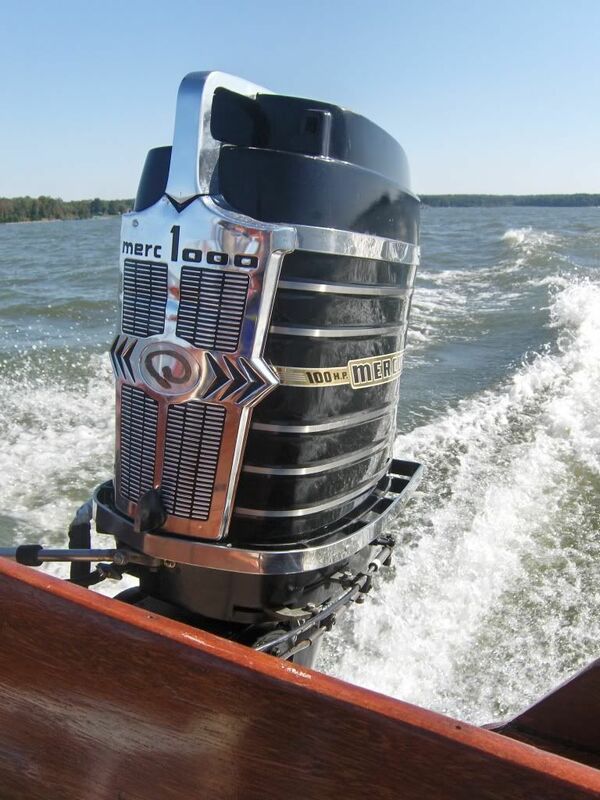 The engine is a Yamaha F80TLRB which I show as being a saltwater engine weighing 356 pounds. The 60 horse Yamaha I show as only weighing 237 pounds. I don't have info on what the 75hp Johnson weighed. No wonder it was prone to squat in the water! Thanks again for the info and tips! Many of 'em have weights of the motors listed. Don't be discouraged. I've seen bigger yard art than what you have. The bottom may well have just been coated with a two part epoxy of some sort. Many unsuspecting wooden boat owners of that time were sold this process as a way to take care of all "problems" of owning a wooden boat. Depending on how well the transom was prepped the fiberglas may peel off with little or no damage to the wood. I agree with Andreas on the boat inspection but I would encourage you to snoop around inside the boat yourself. Check for cracked ribs. Lift the floorboards and look for wood rot and decay or damage. Scan the archves of this forum under the restoration section and you will find many answers to questions that you may have. Good luck and keep us posted. Torchie... thanks for the advice of doing some of my own detective work. Thats a great idea. I wish I could get to the boat now, but it is so far buried in one of my buildings that it would take me a half a day to get to it. I'm pretty excited about the ole girl, so I may just have to go out and do it! I'm going to see if I can find more pictures of it thru the years and get them scanned on here. I also found that the 75 horse Johnson weighs 240 pounds according to the site that Andreas pointed me to. The really great thing is that this boat is what I refer to as a legacy boat. Most of us spent a lot of time trying to find out the history (prior ownership,original equipment,etc) of our boats. You know most of yours already. Also I would encourage you do think about doing the work yourself. Andreas is correct in the fact that boat restorers are very expensive and alot of what they do can be accomplished by you. The advantage now as compared to the 70"s when I started to work on boats is the information available online. Back then you had to find someone that was willing to share their knowledge with you. There is great satisfaction to be had in doing something yourself. Enjoy it. Look for a thread in the restoration section titled "nomenclature" Andreas did a wonderful job of sketching out a complete boat and listing the proper nomenclature for the various parts. The component(s) you refer to as being taken off are called "spray rails" Welcome aboard. The folks on this website are super friendly, informative and make you feel at home right off the bat. I am grateful to have found this site as it is an incredble resource. Ray... don't go off the deep end yet on the transom... just start working with it and see what you can find... I would start sanding with 100 grit in a spot and see what you can go through... I will bet that you can work your way down through the paint, then the cloth and end up hitting decent mahogany. On my Seacoaster, the transom looked rough.. There was a fiberglass covering, sort of L shaped on the bottom 3-4 inches of the transom and under and out 3-4 inches on the hull bottom. It was black and algae green in some areas. When I started sanding the transom, I kept working my way down through that area, and carefully cut off some loose fiberglass, and thought about leaving the one inch up and around lip that seemed really stuck on. Eventually, I sanded through all of it, and ended up with good mahogany ., I think it was put on in the first place, to reduce infiltration through the seam between the planks and the bottom of the transom. Here are a few pics... not as extensicve maybe as what you have, but in the end, I ended up with what I wanted. (The distortion on the varnished right side, is a chunk of poly and maybe newspaper that was between the boat and the bunk. There's a LOT more work there than the transom!! Beautiful job. Absolutely beautiful!! PS: I just noticed that it appears you have the same glitter Attwood steering wheel I have on mine! What a great piece of '50s art deco. Greetings and welcome! This site rocks for info and help. Refer often, and we love pictures! My two cents. Go slow. No need to hurry. It's my biggest struggle. Though I have been saying it for years, I plan to do some structural and bottom work on my sea lancer. I don't have a heated work space, so I have to wait until warm weather. Given the limited amount of time I have, I'm expecting to miss this entire season. I even dropped the insurance on it. Sigh. But to rush it to get it done in time would lead to frustration and even short cuts and short cuts on a structural repair....not so good. So take it slow, find resources you are comfortable with. Set yourself up with a good workspace if you can. The more comfortable the work space, the better. The satisfaction of good work done yourself is priceless. Plus, the skills you learn are applicable to the rest of life. On the Pawcatuck River, CT, at uncle Bills, for the 2009 famiy reunion. Star of the show! I think this one is from two seasons ago - note the missing drivers seat, the painted interior, and the missing side glass. All thanks to a "restorer" that was in a hurry. At least he didnt take the time to do anything to the bottom. That kicker mount on the transom will go away. He stuck it on there incorrectly, making it useless. But I'm not bitter. That's Brother Dave and Niece Elaina - she had a blast driving all day!